I read yesterday that 150,000 are estimated to have been killed in the carnage that is going on in . . . Syria. That’s 150,000 men, women and children. That’s why the Israeli IDF would not let me near the peak of Mt. Hermon, 8 months ago, in June 2013. Three days ago, 2 rockets landed on the mountain. That mountain peak, Mt. Hermon, is home to numerous rare and endangered species. At a nexus where 3 continents meet, it is an important wildlife focus, for the tens of millions of migratory birds that fly over it, and for rare, exquisite butterflies, like this one. One of the species of blue butterflies, tiny, purposeful little jewels that those of us who have read this far love to find and follow, this male has flown for days or weeks, and shows evidence of several interactions with predacious birds, insects and or reptiles and perhaps even mice. But, just look at him! Lost lots of his tiny scales as well as wing edges, yes. Still gorgeous? Absolutely. These blues and purples bedazzle, even then. 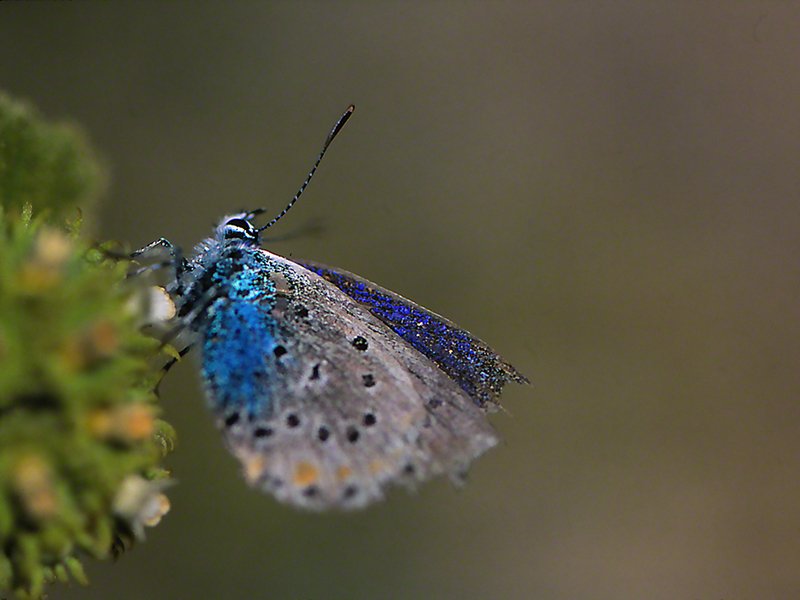 Vladimir Nabokov was to his death the world’s expert on blue butterflies. How he would have been fascinated by this one. Found only on Mt. Hermon, and, as we’ve posted earlier, not to be seen by you and I and them . . . for a very long time ahead. Those lethal weapons on the other side of the mountain, in Syria, will assure that. ← It’s A Coming . . . I feel privileged to see it! Thanks. Even with the loss of the vibrant blue, the wings are still delicate with beauty. What shame and destruction war games do to the wildlife and human life. You wonder how this earth can survive. Beautiful blue. Sad about what weapons of war can do for these and other beautiful creatures of God (human, as well as others) without even giving it a second thought. Thanks for sharing, Jeff. I’ve been fascinated by the Blues too. I learned many female blues are brown. The females lay eggs and at that time they are very vulnerable. They need to blend in with green leaves and brown wood during their egg laying period. The female butterflies are vulnerable at times of peace, it makes you indeed wonder how and if they will survive human war time. Notice the brown female laying eggs and the pre-Blue caterpillar.